Keynote Inaugural Address by Ac. Shambhushivananda Avt. Honorable Chairperson, Esteemed Guests of Honor, Students and members of the Faculty of Utkal University, representatives of all affiliated colleges from Odhisa. It is an honor for me to be present here today to partake in the academic deliberations on the challenges of future education. Future is always uncertain… yet, future is always in our hands. We make it by what we do and what we do not. We are going through difficult times in the world when not only individuals face economic collapse, but entire nations face bankruptcy. The “peak of everything “ scenarios are quite real and billions of people face daily hardships. A critical evaluation of current pedagogy at this time is therefore very befitting for all of us. In order to make it even more meaningful, it is important to remember the old saying of the sages: “Sa’ Vidya’ Ya’ Vimuktaye,” Knowledge is for liberation; physical, mental and spiritual. If we can begin to align our educational endeavors with the perennial search for human liberation and social justice, we may come closer to establishing “heaven on earth”- a peaceful, productive and prosperous world for all its inhabitants. 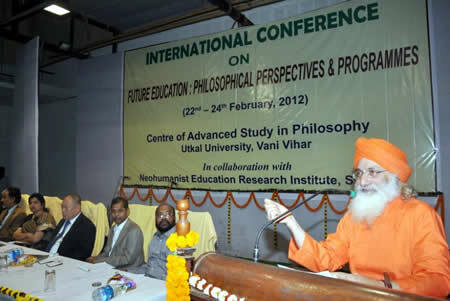 I laud the pioneering efforts of CASP of Utkal University, a leading center of advanced studies of philosophy in India, for hosting this international conference and to go beyond the old traditions and rope-in perspectives, which may seem a little far-fetched and beyond the current map of ideas. It is here that creativity may unleash and enable us to see the world with new lenses than what we are ordinarily used to. Information is not knowledge and not all knowledge is essentially endowed with wisdom. There cannot be a better forum than the Faculty of Philosophy to culture this search for wisdom in the educational and related scientific domains. We now know that one human brain, which runs with less than 25 watts of electrical power, is potentially capable of storing information equivalent to 1019 bits of information. So if even one brain could be properly harnessed, it could make the entire information-networks superfluous. Despite the advancements in the quantum of information, knowledge and analytical abilities, we are still like infants trying to fathom the wisdom of the unseen power, to understand the unexplained regions of the seemingly limitless mind and the physical world spectrum lying beyond the known bounds of relativity. At these crossroads of this world of ignorance lies our pathway for further human advancement. It is indeed the challenge of each generation to bridge this gap between the known and the unknown, between matter and abstract, between crude, subtle and the causal worlds. This work cannot be the prerogative of a few research institutes or a few lone worshippers of the spirit, but must be shared by the enlightened human beings endowed with a searching mind. In this group effort of the human species lies the seed of an emerging renaissance for a happier and a progressive world. It is here that a reflection on our educational principles, curricula, methodologies and reforms of all sorts can be immensely useful. While on the one hand we are the embodiments of the Cosmic Spirit capable of all that can be called Divine and good, we are also the creatures of eccentric force (avidya-shakti) that takes pride in snatching the rights of others and mis-utilizing the bounties of nature irresponsibly for personal gains. The dogmas faced by our present society are a constant threat, which in the garb of pseudo-truths tend to lead the human beings astray on the path of exploitation, suppression, oppression and destruction of fellow human beings and other species. This is unfortunate and educational systems cannot continue to remain a mere silent witness and continue to allow the avidya-maya to play havoc on innocent beings. The greatest challenge for the education today is to find ways to empower Good over evil; Rationality over dogma; Culture over brute force; Truth over falsehood and Spirit over matter. The materialist culture of today has placed moral values on the back burner. 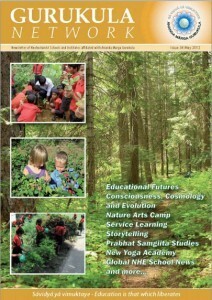 The custodians and guardians of educational traditions have the first and foremost duty to revive the ‘awakened-conscience’ – the essential ingredient in liberating the human intellect from the shackles of geo-socio-sentiments, metamorphosed sentimental strategies, vocal-revolutionaries and intellectual extravaganza of pseudo-intellectuals, who shield those in power, irrespective of moral stance. This will be no easy task. It requires iron-will, indomitable courage, supreme surrender, fearlessness and a flaming love for all animate and inanimate creatures. It is also a task, which cannot be the responsibility of a few sages, but the entire community of educators (acaryas) must imbibe this ideological spirit and come to the rescue of the faltering society. In the words of my mentor Shrii P.R.Sarkar, “without psycho-spiritual guidance, human beings tend towards exploitation and exploitation can be more dangerous in the psychic level than the physical level. In order to avoid physical subjugation and intellectual extravaganza, human beings require proper physical, mental and spiritual training”. Educators must come forward to provide such training. First, how to save the society from extinction due to rising “peak of everything” scenarios? This is an existential question and we all need to face it. The industrial revolution was devoid of higher moral compass and the combustion engine based industrialization has brought us to the brink of a cliff –beyond which lies dark gloomy scenarios. I am glad that persons like Khun Krisada Kampanatsanyakorn are trying to offer a paradigm shift to enable us to leap-frog into renewable energy age and are giving us practical solutions to bring energy self-sufficiency, affordable habitats, food security and above all, show us an alternative mode of thinking for global sustainability. This is no small achievement and educators must become familiar with their philosophical approach. Our educational curricula may need to reflect such alternative paradigms. Secondly, we must recognize that humans embody a complex galaxy of emotions and propensities that make them the most intriguing creature on this planet. They also create a society which is equally complex and colorful. Social scientists, therefore, must come forward to unravel the dynamics of social-evolutionary changes. The dualities of confrontation and compassion; love and hate; war and peace; conflicts and resolutions; affluence and poverty; ugliness and beauty – all these remind us constantly of the great challenge of education – to bridge the gaps of disparities while preserving the diversities of complex systems and to equip us to move towards a world of peace, harmony, affluence and contentment. Finally, we should have no illusions that our past has been bleak. We have witnessed both wonderful and not so pleasant times in human history. We can neither avoid the past, nor ignore the present. Any discussion about the future should, therefore, begin with glancing back with the objective of reflection, reconciliation and observing the burying rituals of the past that is behind us. We cannot change the past and we are caught in the present which is the product of our past realities and visions. To acknowledge the past and all its pitfalls is a brave step to face the future. Hence, a constructive glance at the past may not be out of place in this futures-oriented seminar. We may however, be constrained by time factor and so we may need to be brief and focus on most essentials. Yet, we need to focus on future possibilities rather than lament over lost opportunities. How do we translate our hopes, longings, aspirations into reality? How to prevent falling into the same pitfalls & traps, as we had in the past two millenniums? These challenges will require deep philosophical introspections and dialogues. It is exciting to have great scholars and thinkers at this international seminar/conference and I am as excited as all of you to go ahead with exchanges and deliberations without further adieu. Perhaps, we may rediscover the messages of the Messiahs of the past in a new way and come to the old conclusion that: “Knowing Oneself is the Real Knowledge” and to attain it we need a balanced pursuit of “Inner and Outer Ecological Harmony”. Now, although there has been intellectual progress, there is a crisis of civilization. What is the breeding ground of this crisis? Why the crisis? The crisis is that human existence, which is highly developed, has been endangered by dogmas. Its very existence on the psychic level has been endangered by dogmas. On the physical level it may or may not be endangered, but on the psychic level there is danger. If you get guarantees on the physical level regarding eating and drinking, sleeping and getting shelter, that will not suffice. You want to be danger-free in the realm of your mind, in the realm of your intellect. You want unbarred, unobstacled psychic progress – intellectual progress. But certain dogmas with their devouring mouths are trying to eat you up. …Everybody is moving, knowingly or unknowingly, with so many ideas, with so many feelings, with so many propensities, with so many desires. But each and every aspirant, each and every artist, each and every scientist and each and every philosopher must be ensconced in this supreme veracity – that they will have to be one with the Supreme, that each will have to coincide his or her microcosmic nucleus with the Macrocosmic one. And while moving towards this Macrocosmic Nucleus, no bar should be tolerated, no obstacle should be encouraged. Let there be an unbarred movement of humanity, let there be an unbarred progress of humanity. Humanity that knows no colour, no racial or garb barrier; no historical or traditional barrier. Human beings have got the same human legacy, and they must boldly stand upon that legacy and move forward with the banner of universal humanity.